Rhacodactylus auriculatus is a medium to large sized semi arboreal member of the Rhacodactylus genus. Gargoyle Geckos are a nocturnal species that will spend the day sleeping. They are very vocal at night and it is not uncommon to hear barks, squeaks, and growls as they talk to each other. Under proper care, Rhacodactylus auriculatus has the potential to be very long lived gecko. They occur in many colors, including varying shades of greys, browns, white, yellow, orange, and red, with varying patterns of blotches and striping. Since gargoyles are considered arboreal, you must think three dimensionally. So “space”is not necessarily the size of the enclosure, it’s the area of usable, climbable structure within the enclosure. The enclosure should be furnished with plenty of thick branches, cork bark, or other rough climbing materials that provide good support and plenty of hiding places. Because gargoyles rely predominantly on their claws and tend to be heavy as adults, structure should be able to support the weight and be claw friendly. Avoid hard smooth surfaces. I always recommend corkbark and lots of it, basically as much as you can fit into your enclosure. It’s available in flats, half rounds and tubes (gargoyles LOVE the tubes). It provides ideal climbing surface with good texture and tons of surface area as well as making great hides. Minimum enclosure size for a single sub-adult or adult animal should be around 20 gallons – 0.3 x 0.3 x 0.6 meters (1 x 1 x 2 feet); 30 gallons – 0.45 x 0.45 x 0.6 meters (1.5 x 1.5 x 2 feet) for an adult pair. I recommend an enclosure no bigger than 8 gallons for a baby or hatchling, smaller is better. I personally like tubs. They’re cheap, easy to clean and maintain and they hold humidity the best. I like the opaqueness too, I think it helps keep the animals calmer overall. The only real down side is looks, they don’t display very well. Hides should be tight and dark and allow the gecko to be out of sight. Multiple hides work best, both low and high. IMO, foliage alone does not make good hiding. Tubes and hollows seem to be a favorite. There are varied opinions on which substrate is best to use. For a simple set up, babies, acclimation or a quarantine period, I’d recommend paper towel or news paper only. For a more naturalistic appearance a peat moss and soil mixture work very well. Any one of the commercially available substrates that will hold some amount moisture should work very well. Because they are nocturnal, gargoyle geckos do to not require supplemental lighting. However, a day/ night cycle should be provided, just a small amount of natural light from a nearby window will do. The ideal temperature for gargoyle geckos is around 24 °C (75 °F). Temperature range is around 18-29 °C (65-85 °F). In many cases they can be kept without supplemental heating at room temperature. Although it is not a necessity, gargoyles will utilize a basking spot if one is provided. Basking temperatures should be around 27-29 °C (80-85°F), just make sure you have a cooler area too. This species can be maintained at 24-28 °C (74-82 °F) during the day and 20-24 °C (68-75 °F) at night. Avoid prolonged ambient temperatures over 29 °C (85 °F). Gargoyles will drink from a bowl, fresh water should always be available and changed regularly. A large water dish can also help maintain higher moisture levels inside the enclosure. Gargoyles will get a substantial amount of their required moisture when eating because the fruit based diets are mixed with water. Gargoyle Geckos do enjoy moderate humidity and the occasional misting, but they should not be kept wet. Humidity is probably the most important aspect of their care. They require a stable relative humidity of at least 50% and preferably closer to 70% to prevent retained sheds. The moisture levels can directly affect the feeding response too, animals kept to dry will eat less. There are several ways to increase and maintain humidity. Misting is one and in my opinion, should only be done to modify the humidity, not to water the gecko. Remember, you do NOT want a wet cage. A large water dish will help, live plants do too. I always recommend an enclosure with ventilation on the sides instead of the top. Humidity rises with heat so a screen top just allows the moisture to escape. Gargoyles are considered omnivorous. In the wild they feed on other geckos, insects, nectars, saps and fruits. In captivity they are fed primarily fruit based powdered diets that are mixed with water or fruit juice. I use Repashy Classic as a staple and mix in a small amount of Pangea Complete for additional scent and flavor. In my opinion the Repashy is better nutritionally, but the geckos definitely like the taste of the Pangea better. Most geckos only eat the diet twice, maybe three times a week, but the mixed diet should always be available and get replaced every two or three days. In my colony, insects are offered once a week. 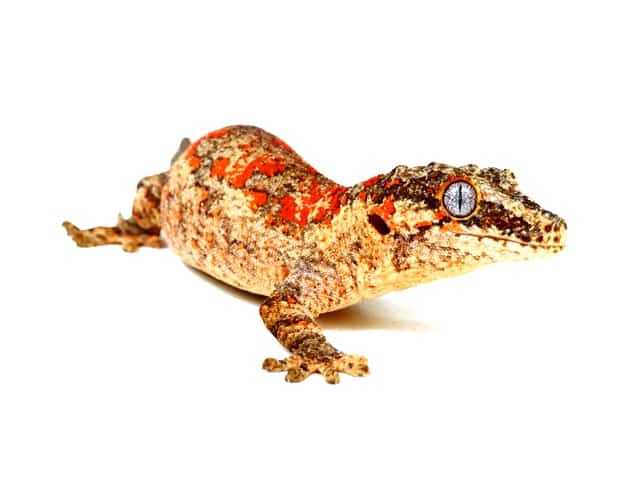 Most geckos, depending on size, will eat 2-5 bugs at a time. I feed predominantly crickets but they will take dubias and mealworms too. Every bug should be gut loaded just before feeding your gecko and dusted with a powdered calcium containing D3. Every third bug feeding I dust with a vitamin/mineral supplement too. Gargoyle Geckos are known for being very easy to handle, though some may gape their mouths when first picked up, most will not bite if handled with respect. They tend to be less flighty than Crested Geckos, and will often sit calmly for hours. In my opinion, gargoyles as a species are probably the most tolerant of geckos to handling. Once they get to know you they are very comfortable just hanging out perched on your shoulder. Cleaning is done on an individual basis. Some geckos make more of a mess than others, especially the ones that feel the need to step in the food dish while eating. I spot clean every few days and do a major cleaning probably once a month. Shedding is dictated by growth and every animal is a little different. Gargoyles often go into blue and shed within just a few hours. They will often do it at night, and they eat the shed skin so you may never even see it. Gargoyle geckos have proven so far to be very healthy captive animals. They are probably one of the least prone to disease geckos available. Most of the real health issues I’ve seen so far have been more husbandry related. -Metabolic bone disease is probably the most common and if caught soon enough can often be reversed. The importance of proper supplementation and the use of a calcium containing vitamin D3 cannot be over emphasized. Calcium with D3 should not be given regularly to animals kept under full spectrum UV lighting. -Shedding issues may arise if the proper moisture levels are not maintained. It’s important to keep the humidity above 50% all the time. Signs of low humidity are stuck shed, often on the toes, tail. Dry wrinkly skin, the skin should be smooth and soft. -Internal parasites can sometimes cause problems too. If your gecko has weight loss, loss of appetite, seems lethargic or has unusually runny stool, its probably time for a vet visit.